The next logical step after simple bouncing ball example is something which uses a real, full-featured physics engine. Box2D is usually the popular choice. Combining Box2D with Qt has been done by many people, recently demonstrated before by Andreas and Thorbjørn. I decided to pick something else, i.e. Chipmunk physics engine. Because this is supposed to an example, I tried to make it as simple as possible (you'd be able to extend it, once you grab the basics). Basically we have a box full of colorful marbles (yes, I loved to play marbles when I was a kid, there was not any PlayStation back then). A mouse click, or a screen tap, will generated a new marble with a random color. 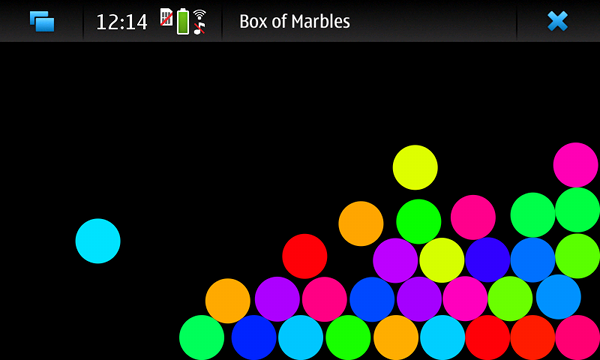 If you run the example on Nokia N900, you can control how the marbles move and hit each other by tilting and shaking the phone. Check the code yourself at the usual X2 repository under the demo/marblebox subdirectory. Make sure you open and follow the instructions in the included README file. For a sneak peek, just watch this video (or enjoy on YouTube). There is still a sequel to this marble box. And still with Chipmunk. Is it better than box2d ?I, want to create a qt wrap library around a 2d physics engine and qgv,that should be great.